Take a trip around the world with CBC Radio's As It Happens. Hear from the people at the centre of the stories of the day. 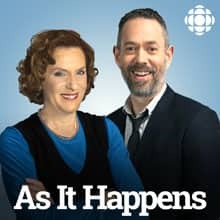 From the complex to the weird and wacky, As It Happens brings you the voices you want to hear. Listen to our podcast and on Fridays, we pull back the curtain on how we make the show with the podcast extra. Montreal Hypothermia Death, Zimbabwe Crackdown, Right to be Forgotten, Labrador Passenger, and more.